After World War II, the allies captured some planes from the Imperial Japanese Navy and Imperial Japanese Army. Some planes were still used for transport duties and operations. In most cases, white color was used for fuselage and highly visible GREEN CROSS was used as sign of surrender. This is the story of the Ki-46 as illustrative example of this interesting fact of the post-war. The Mitsubishi Ki-46 was a twin-engine reconnaissance aircraft used by the Imperial Japanese Army in World War II and the Army designation was Type 100 Command Reconnaissance Aircraft. The Allied nickname was “Dinah”. 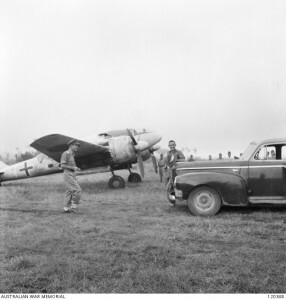 Some planes had a curious green cross after World War II ended.In this case, the Mitsubishi Ki-46-III white painted with a green cross on the rear fuselage indicates a sign of surrender. Credit: PHOTOGRAPHER SSGT R. L. STEWART. Interestingly, this Mitsubishi Ki-46 II aircraft showing the GREEN CROSS symbol has been published as limited edition by Hasegawa Manufacturer in February 2016. ◀ The Stealth Aircraft Mitsubishi X2 ATD-X Shinshin (Heisei Zero) successfully flew a test flight.